By far the best part of Little Morocco is the relaxed experience of sharing tea outside with groups of Middle Eastern and North African men and families. 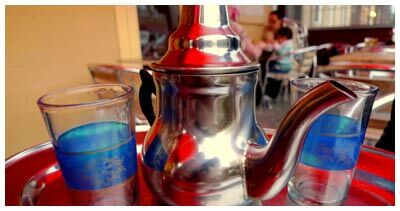 Grab a pot ($5, below) and take a seat outside to enjoy the delicious, sweet mint tea that is ubiquitous in Morocco and similar countries. A good way to start is a nice-sized bowl of harrira ($3), a soup served at evening times in Morocco almost everywhere. With bread, your money really goes a long way, and this is always a satisfying, and warming slurp. After placing your order at the counter, the friendly staff will have you take a seat and bring out your order as it becomes ready. It's best to share, otherwise someone might get their meal far ahead of the other. I am a sucker for a tagine, so I was anxious to order one here. Early in the evening they were already out of lamb ($10) and kefta ($8), so we settled on the chicken tagine ($8, below), which was unfortunately underwhelming. The first point that speaks of preparation is that the dish here is not cooked in a heavy clay pot, and instead is plated from the steam table. In my opinion, this is not a tagine at all, since the name derives straight from that pot. It also leads to a dish that comes out overly dry. The meat is very tender at the same time, and falls right off the bone, but parts are still lacking the moistness that usually accompanies this type of dish. It is however a lot of food for the price, as most dishes here are. The merguez platter ($9, below) was also a bit of a letdown, despite being tasty in its own way. The sausages are just too dry to enjoy fully. The vegetable medley that can accompany it as one of your sides is satisfying though, and I ended up cutting the meat into pieces and trying to eat it all together. Based on this experience, I think the restaurant probably shines brighter at lunch, when things are fresher and the sun is high in the sky. Eat your big meals at that time and stick to the harrira at night, just like you would probably do in Morocco.